News – Farm Safety Nova Scotia – Safe Farming. Safe Families. Safe Employees. Have you seen our January edition of the Monthly Insight?? If not, click here to check it out! Also, click here to subscribe to the Monthly Insight! Check-out the December 2018 Balance newsletter from Morneau Shepell! Lots of great tips on family life, health and more! Want to have a look at the December edition of the Monthly Insight?? Click here to check it out! Also, click here if you would like to subscribe to receive the Monthly Insight! We all know that winter weather in Nova Scotia can be unpredictable. 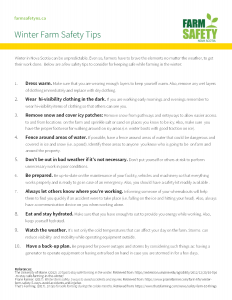 Check out the tips below on staying safe while farming in the winter months. Congratulations to all of our talented winners!! Check out the winning videos on our Farm Safety YouTube channel and keep an eye on our social media to learn how you can get your own Farm Safety Nova Scotia 2019 Calendar featuring all the winning drawings! !